The death of civilians on either side in the Israel-Gaza conflict is tragic – especially when children are among the casualties. 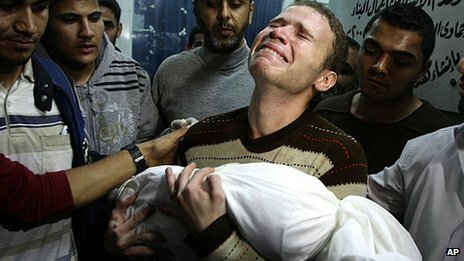 The BBC correspondent in Gaza, Jon Donnison, witnessed just such a tragedy at close quarters. My friend and colleague Jehad Mashhrawi is usually the last to leave our Gaza bureau. Hard-working but softly spoken, he often stays late, beavering away on a laptop that is rarely out of arm’s reach. He has a cool head – unflappable, when others like me are flapping around him. He is a video editor and just one of our local BBC Arabic Service staff who make the office tick. But on the Wednesday before last – only an hour or so after Gaza’s latest war erupted with Israel’s killing of Hamas military commander Ahmed al-Jabari – Jehad burst out of the editing suite screaming. He sprinted down the stairs, his head in his hands, his face ripped with anguish. He had just had a call from a friend to tell him the Israeli military had bombed his house and that his 11-month-old baby boy Omar was dead. Most fathers will tell you their children are beautiful. Omar was a picture-book baby. Standing in what is left of his burnt-out home this week, Jehad showed me a photo on his mobile phone. It was of a cheeky, chunky, round-faced little boy in denim dungarees, chuckling in a pushchair, dark-eyed with a fringe of fine brown hair pushed across his brow. “He only knew how to smile,” Jehad told me, as we both struggled to hold back the tears. “He could say just two words – Baba and Mama,” his father went on. Also on Jehad’s phone is another photo. A hideous tiny corpse. Omar’s smiling face virtually burnt off, that fine hair appearing to be melted on to his scalp. Jehad’s sister-in-law Heba was also killed. “We still haven’t found her head,” Jehad said. His brother, Ahmad, suffered massive burns and died of his injuries in hospital several days later. Jehad has another son Ali, four years old, who was slightly injured. He keeps asking where his baby brother has gone. Eleven members of the Mashhrawi family lived in the tiny breezeblock house in the Sabra district of Gaza City. Five people slept in one room. The beds are now only good for charcoal. The cupboards are full of heaps of burnt children’s clothes. On the kitchen shelves, there are rows of melted plastic jars full of Palestinian herbs and spices, their shapes distorted as if reflected from a fairground mirror. And in the entrance hall, a two-foot-wide hole in the flimsy metal ceiling where the missile ripped through. Despite the evidence pointing towards an Israeli air strike, some bloggers have suggested it might have been a misfired Hamas rocket. But at that time, so soon after the launch of Israel’s operation, the Israeli military says mortars had been launched from Gaza but very few rockets. Mortar fire would not cause the fireball that appears to have engulfed Jehad’s house. 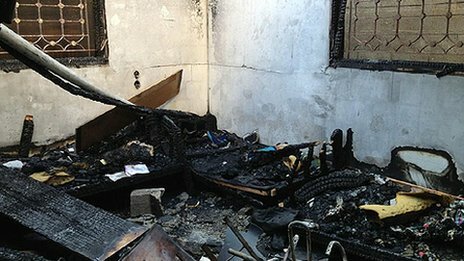 Other bloggers have said that the damage to Jehad’s home was not consistent with powerful Israeli attacks but the BBC visited other bombsites this week with very similar fire damage, where Israel acknowledged carrying out what it called “surgical strikes”. As at Jehad’s home, there was very little structural damage but the victims were brought out with massive and fatal burns. Most likely is that Omar died in the one of the more than 20 bombings across Gaza that the Israeli military says made up its initial wave of attacks. Omar was not a terrorist. Of course every civilian death on either side – not just Omar’s – is tragic. The United Nations says its preliminary investigation shows that 103 of the 158 people killed in Gaza were civilians. Of those, 30 were children – 12 of whom were under the age of 10. More than 1,000 people were injured. The Israeli government spokesman Mark Regev said every non-combatant death or injury was tragic and an “operational failure”. In Israel, too, there were fatalities: four civilians and two soldiers. There were also many injuries. But the fact the Israeli Ambulance Service was also reporting those suffering from anxiety and bruises is an indication of the asymmetric nature of the conflict. 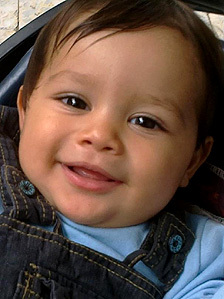 Jehad’s baby Omar was probably the first child to die in this latest round of violence. Among the last was a six-year-old boy, Abdul Rahman Naeem, who was killed by an Israeli attack just hours before the ceasefire was announced. Abdul Rahman’s father, Dr Majdi, is one of the leading specialist doctors at Gaza City’s Shifa Hospital. The first he knew of his son’s death was when he went to treat a patient, only to find it was his own boy. Apparently, Dr Majdi had not seen Abdul Rahman for days. He had been too busy dealing with the wounded. Before I left Jehad’s house, leaving him sitting round a camp fire with other mourners, I asked him – perhaps stupidly – if he was angry over Omar’s death. “Very, very angry,” he said, his jaw tensing as he glanced at the photos on his phone. This from a man who I cannot ever remember raising his voice in anger. My thoughts, after a week where I have had little time to think, are with Jehad and his family. Remarkably and unnecessarily, he told me his thoughts were with me and the rest of our BBC team. “I’m just sorry, Jon, that I had to go and wasn’t there to help you with your work,” he said, before we hugged and said goodbye. Zaytoun soap Support Palestine in their soap industry by buying from here!